Simostronomy: SimoCowboy Ready to Roll! Next week is a conference I have been excited about attending for a long time. It's an entire week devoted to my specialty, cataclysmic variables. The list of attendees is a literal who's who of CV research. The conference is called Wild Stars in the Old West II. This special get together doesn't come around that often. I wouldn't miss it for the world. 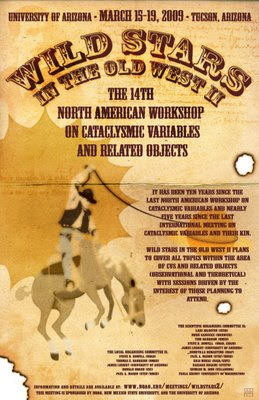 "It has been ten years since the last North American Workshop on Cataclysmic Variables and nearly five years since the last international meeting on cataclysmic variables and their kin. Of particular interest since these last meetings are new results based on observational platforms such as GALEX, Spitzer, Chandra, XMM INTEGRAL and Swift/BAT, large surveys such as SDSS and planned Pan-STARRS and LSST, smaller but equally important surveys such as All Sky Automated Survey (ASAS), Catalina Sky Survey, ‘Pi of the Sky’, ROTSE, results from large aperture ground-based telescopes, theoretical advances, and evolutionary relationships of CVs to other binary stars." I plan to blog about the proceedings and talks, and I'm taking a digital audio recorder to do some one on one interviews with some of the leaders in CV research. These will be turned into podcasts for Slacker Astronomy and Restless Universe. Sunday is a travel day, and the welcome get together in Tucson. Monday, the real stuff begins. Check back for updates next week. Cool, wish I could join you!